Newman said the reports were exactly what he expected: Huge fastball. Spotty command. Inconsistent secondary pitches. “But if you don’t like that, you need to be in another business,” Newman said. De la Rosa and Bleich will be in a Double-A rotation that will most likely include recent 40-man addition Hector Noesi. Noesi made just nine High-A starts last year, but Newman said he will “probably” open in Trenton. Put Chris Garcia in the Double-A rotation as well. The high-ceiling, often-injured right-hander is currently throwing and should be ready to open the season back in Trenton. Newman said Betances should be ready to pitch close to the start of the season. He’s slated for High-A Tampa. “Brack’s got stuff that’s top-of-the-rotation stuff,” Newman said. Brackman’s overall numbers were bad last season, but through his last four appearances he pitched 10 scoreless innings, walking none and striking out nine. “We can simulate everything in the minor leagues except the three decks,” Newman said. That third deck makes the ball difficult to track, and it takes some getting used to. “I think they brought in one of their superstar guys,” Newman said. “But (Miranda) played well.” Through 13 games, Miranda has a .409 average with two home runs and 11 RBI. The St. Louis Post-Dispatch reported late last night the Cardinals and Matt Holliday are “moving closer” to a deal worth over $100 million. That means he might be making more than Albert Pujols, which is ridiculous. Then again, so is Barry Zito. If the deal goes through, that makes Johnny Damon arguably the best position player left on the market. Where will he go? Here are some teams I think are in need of a left fielder/designated hitter: Orioles, Indians, Athletics, Braves, Marlins, Giants, Tigers and still possibly the Yankees. The only team I’ve heard Damon linked to this offseason is the Yankees, but I really doubt both parties can come to an agreement at this point. The rest of the teams listed are purely my speculation. At first I was thinking he could end up back with the Red Sox, but I forgot they already found a replacement for Jason Bay — Mike Cameron. So now I predict he will sign with the team he played for in 2001, the A’s. They have no left fielder (Scott Hairston) and really no DH. Billy Beane says he wants to keep his team younger, but I think Damon fits in Oakland. What an ugly sight of the snowy Yankee Stadium! This picture was taken by Tom Kaminski of WCBS 880 (found by Zell’s Pinstripe blog). Today seems like a pretty quiet day on the Yankees’ front, so I figured it would be a good time to start doing Joe Girardi’s job by picking the 25 guys he will carry to Boston on April 4 on opening day. I’d take Gaudin and Melancon as my relievers and Pena (the best fielder of the bunch) and Miranda (the best hitter of the bunch) as my bench players. Would you agree? Note: Yankees are almost certain to add an outfielder and/or bench player before spring training comes. WFAN’s Mike Fancesa reports the “major” news for the Mets is they have agreed in principle to a four-year, $66 million contract with Jason Bay plus an easy vesting option for a fifth year. He still has to take a physical, but if all goes well he’ll be a Met by early next week, Francesa said. CLEARLY, this is just an act of getting back at me for the mean Photoshop I posted a few days ago (sarcasm). So can the Mets contend with the Phillies now? I don’t think so with their pitching staff the way it is now. By the way, this move affects the Yankees too. Now Johnny Damon has one less suitor. Despite what Brian Cashman is saying about keeping a lower payroll, it’s still possible a deal could happen. Possible, but unlikely. Peeking over at my poll on the left, the first outburst of fans are trusting Brett Gardner to start in the outfield in 2010. However, Jon Heyman is tweeting the Yankees are looking to add an outfielder and will be disappointed if Mark DeRosa signs with the Giants. Those talks have been moving slowly since last week, but it appears they’re really trying to close the deal soon. You might be wondering why Brian Cashman doesn’t just outbid the Giants for DeRosa. If you are, you should know the Yankees are reportedly looking to avoid a big increase in payroll, as they currently stand at approximately $200 million for 2010. Also, Heyman attempted to minimize the talk about the Yankees’ interest in Jermaine Dye by tweeting other teams have more interest. I don’t think his poor defense belongs in the Yankees outfield anyway. Jeremy Reed sounds like a cheaper and better option to me. The Yankees are reportedly interested in signing free agent Jermaine Dye, according to Phil Rogers, and it wouldn’t be the first time Brian Cashman showed some interest in the soon-to-be-36-year-old right fielder. That’s definitely respectable production, especially in comparison to Brett Gardner’s. I’d project the righty to post a similar year offensively to 2009 with the Yankees in 2010, but perhaps more RBIs because of who would be in front of him in the lineup. However, if the Yankees sign him, they’ll have to switch Nick Swisher to left and put Dye in right. Swisher’s played 117 games in left in his career while Dye has spent 98.6 percent of his career manning right. Dye is a quality right fielder, but is aging and his range is definitely inferior to Gardner’s. UPDATE: Jason over at It’s About the Money, Stupid! informs me Dye is an AWFUL right fielder. Good to know. I’m not sure how much money Dye is looking for, but I’d guess maybe a two-year deal worth $7MM/yr. If I’m the Yankees, I stick with the speed and defense of Gardner or keep an eye out for Reed Johnson or Jonny Gomes. Note: Rogers said the Yankees were shopping Sergio Mitre and Chad Gaudin. Why not kill two birds with one stone by trading one or both of them for a left fielder? Just a thought. Jose Molina’s career with the Yankees is most likely over, so I thought he was worth remembering him before he is forgotten. 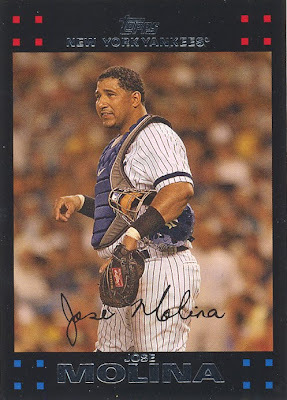 Molina was a fine backup catcher for the past three seasons, playing as many as 100 games in 2008. He was a dreadful hitter, but he certainly had the defensive skills to make up for it — your prototypical backup catcher. He threw out 38 percent of base stealers with the Yankees in 126 opportunities. His best play in recent memory was picking off Jayson Werth at first base in Game 2 of the World Series. However, Molina also will forever be the answer to this trivia question: “Who was the last player to hit a homer in the old Yankee Stadium?” Of all people, Molina? Click to buy at fanhouse.com! Yes, that jersey on display above is a Kei Igawa road replica jersey and I couldn’t help myself from posting it. I was perusing Fanhouse.com and it kept on saying, “Sale! from $39.99” under Yankees jerseys. Now I know why. So, who’s buying that for my half birthday? World Series MVP Hideki Matsui and Johnny Damon’s bat at the top of the order will be missed, but fans voted the replacement duo, Nick Johnson and Curtis Granderson, a better combination for 2010. Johnson and Granderson received 67 percent of the vote of over 100 responses. I have to say, that’s a lot of confidence for two guys who don’t have track records that compare to Matsui’s and Damon’s. However, getting younger and getting cheaper while not losing a lot of production was the right way to go, I think. Next poll: Do you trust Brett Gardner starting in the outfield in 2010? I think it’s pretty clear the No. 5 starter will either be Joba Chamberlain or Phil Hughes. Having both set up for Mariano Rivera sounds nice, but it would be a lot nicer if one of those pitchers panned out to be a top starter in the league. Neither will get a chance to reach their potential if both are stuck in the bullpen. It looks as though the fifth starter for the Yankees will be decided based on how the candidates perform in spring training. If this holds true, I won’t be a happy camper. I’ve always been skeptical of spring training statistics. I’m not going to even bother bringing up all the cases of the players who struggle in spring training and then start the regular season hot, and vice versa. So I ask, why base such an important decision for this year and the future on somewhat faulty stats? The pitchers’ mechanics/stuff and their catchers’ remarks will also factor into the decision, but I still think it shouldn’t have an impact on such an important call. I’m no pro, but I remember I’d always have a tough time getting my stuff back to midseason form when I first got back to the mound. The point is, a pitcher’s performance in spring training isn’t a great projection of performance in the games that count. The decision should be based on how both Hughes and Chamberlain have performed as starters and relievers in the games that have counted. I know there’s a good chance both will start at some point no matter who wins the job due to injuries. But it’s the principal of the thing. The guy who the Yankees organization think has the better future as a starter should get the nod. Past experiences should certainly factor into the equation, and have far more importance than spring training in 2010. For some reason, I was feeling cruel today. When the Red Sox signed John Lackey, there was no question the Yankees’ biggest rivals had the better rotation. But after the Yanks picked up Javier Vazquez in a trade with the Braves, the rotations look even again from a distance. Since I don’t expect any more additions to either rotation, I thought I’d take a closer look at the situation. To make the overall comparison as close as possible, I will give each comparison a ranking from 1-10. Five means the two are dead even, and 10 is a huge edge to whomever I list. Why: Looking at both pitchers’ ERAs recently, Sabathia holds a clear advantage. His 3.37 ERA tops Beckett’s by nearly half a run last year, and that was CC’s highest in the past three years. Beckett’s numbers lie in a small tier below Sabathia’s. Another key advantage the big lefty has over Beckett is his durability. Beckett has been fairly healthy in recent years, but Sabathia has just been healthier, starting 14 more games in the past three years. There’s no reason to believe Sabathia is going to slow down, as both starters are 29 years old. Why: Lester is coming off two excellent years and will be 26 years old on Opening Day. Burnett, a very inconsistent starter over the course of a season, has posted very consistent numbers recently. And quite simply, they fall well short of Lester’s. Lester would have matched up pretty evenly against Sabathia, but since he is still considered the No. 2 of the staff I felt it was important to compare each pitcher like they would match up in a series. Why: Durability is key once again in this comparison. Lackey has been posting better statistics recently, wile Pettitte has pitched in more games. Lackey’s numbers are better, but if you factor in his replacement’s statistics the two are very close. Lackey has pitched to an ERA below four in five straight seasons, while Pettitte’s ERA has been above four for four years in a row. Why: Vazquez has started at least 32 games for 10 years running. He showed he could dominate the National League last year, and has had some success in the American League pitching for the White Sox. His last stint with the Yankees in 2004 ended sourly, and it will be interesting to see if he can forget about the past. Daisuke was awful in 12 starts last year, missing time in April, May and all of July and August. There is very little doubt he can return to his 2008 status of top 5 in Cy Young voting, but most expect some sort of an improvement from him. Why: It hasn’t been decided yet, but Chamberlain looks like the favorite to take the job because the Chien-Ming Wang booted Phil Hughes — not Chamberlain — out of the rotation last year. I wouldn’t project Hughes to post drastically different numbers than Chamberlain anyway if Hughes wins the job. Although, I’d project an improvement for Chamberlain because he won’t have to worry about an innings limit. On the other hand, take a look at Buchholz’s game log last year. If I subtracted his four worst starts, his ERA becomes 1.91. If he can work out those kinks next year, the Red Sox might have the best No. 5 starter in the game. Why: Because I can add. Nothing is final yet, but this should serve as a nice side-by-side look at the two rotations heading into Spring Training. Note: If you’re a Yankees fan and trust my rankings, you should still be happy. The Yankees have a far more dangerous lineup right now, and will still hold an advantage even if the Red Sox sign Matt Holliday or Jason Bay. I’ve been meaning to write a post comparing the Yankees’ and Red Sox’ rotations, so look forward to checking that out first thing tomorrow morning. Anyway, after going through my 177 unread items on Google Reader, it sounds like you followers and I didn’t miss too much involving the Yankees the past couple days. If you’re interested in some of the ideas for left field being tossed around, below is a small link dump for y’all. 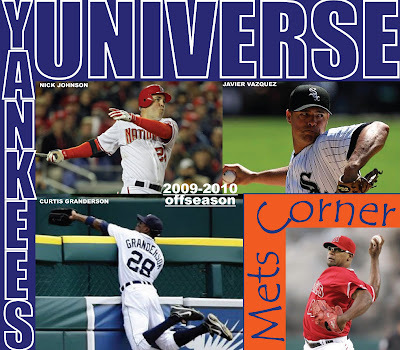 Sam Borden of the LoHud Yankees Blog presents three new options for left field in 2010. And a couple more options from Joel Sherman of the NY Post. Left field hasn’t exactly been the steadiest position for the Yankees going to back to 1996. Larry at the Yankeeist turns back the clock. I hope everyone had a nice holiday break! Next up is New Years Eve just a week away. Yanks’ outfield picture: Who’s in left field? The first option is to fill the whole from someone within the organization, namely, Gardner. Can he handle the starting job with Jamie Hoffmann as his backup? I say yes! Most believe he’s an awful major league hitter — I did too until I bothered to look at his numbers (.270 BA/.345 OBP/.379 SLG, 26 SB in 284 plate appearances). To me, that’s easily good enough to be a No. 9 hitter — even in the Yankees’ loaded lineup. Instead of acquiring someone to take his place, they could add a better backup than Hoffmann. "I will continue to look at any remaining piece," Cashman said. "But it won't be a big piece. Any speculation about some high-end player who has big ability and dollars attached on a large scale would be inappropriate." Going by that, Cashman is looking for a cheap, possibly one-year deal — so he can pursue next year’s strong FA class — so don’t expect a big name in left field in 2010. This is who the Yankees seem most likely to deal for if any at all. He’s at the top of the Yankees’ wish list, according to Bob Klapisch of the Bergen Record. He’s been a journeyman over the past six years, playing for five teams (two in AL). He usually brings a solid bat to the table, but his numbers have declined considerably over the past three years (.293 to .250 BA). He’s only played 412 innings in left field, but he gives the Yankees some flexibility if they want to give an infielder a day off. If he won’t accept a one-year deal around $5MM, I say he’s not worth it. This is where you have to use your instincts. You’ve read what Cashman said about not looking to sign a big piece this winter. However, he also said that last year and then he signed Mark Teixeira. Let me start off by saying it would be a disgrace if Damon came back at this point. He already rejected a two-year, $18 million contract from the Yankees. That won’t go over too well with the fans if he's in pinstripes next year. I say, he’s out of the picture. But then again, he’s an “idiot.” Who knows. As for Holliday and Bay, I don’t think either is a guy the Yankees want to make a key part of this franchise. Their core group is already intact, and with their payroll hovering around $200 million right now, I don’t see them jumping another $15 million. Cashman is loving the trades this offseason. He’s made three big ones so far, two being huge. As far as I know, he’s probably finalizing a trade right now with Ichiro, and somehow he’ll keep Phil Hughes, Joba Chamberlain and Jesus Montero on the team! Thought I’d bring back this photoshopped image below to remind you how crowded last year’s outfield was. Is Vazquez the No. 4? Why is everyone automatically deeming Javier Vazquez the No. 4 starter? Just because he’s an addition, doesn’t me has to wait at the end of the line. CC Sabathia is still the ace, definitely. However, I’d argue Vazquez has been just as good, if not better, than A.J. Burnett and Andy Pettitte over the past three years. I think using a statistic that takes into account the league the pitcher has pitched in is best suited for this comparison. ERA+ (via Baseball-reference) is just like normal ERA, but factors in ballpark and league adjustments. A score of 100 means league average, above is better, below is worse. Vazquez stands out. They’ve all pitched approximately 200 innings per year too. I’m not sure where I’d put him, but I don’t see it as a no-brainer at No. 4 like everyone else. There hasn’t been a more active general manager in baseball than Brian Cashman in the year 2009. He’s got the right mindset, and it sounds like he’s a different pitcher, at least, that’s what the fans voted. He’s got five more years of experience under his belt (three in the AL). Now he’s faced his fair share of AL hitters, while in 2004 he entered with hardly any experience against the AL. I think the 2010 Yankees easily offer the best offensive support he’s had in his career. With a team that will probably average around 5.5 runs per game, I fully expect him to collect at least 15 wins. Presumably, he’ll be a middle or back end of the rotation guy instead of the ace, so he doesn’t have to deal with that pressure of leading a staff. The pressure dial has been turned to its off position. As for the rest of the trade, the Yankees have a lot of benefits to outweigh losing their league-average starting left fielder. Melky Cabrera was a fan-favorite, Robinson Cano’s lover, YouTube star and perhaps a blooming hitter. Brett Gardner and Jamie Hoffmann can rock-paper-scissors for the last outfield spot for now, but I doubt either will be in the opening day lineup. Because Vazquez is only signed for 2010, the Yankees could get some compensation draft picks back if he rejects an arbitration offer after the season. That helps make up the loss of pitching prospect Arodys Vizcaino, who just turned 19. He had a ways to go before pitching with the Yankees. I’ve learned Boone Logan, like Michael Dunn, is a lefty specialist (lefties have hit .231 against Logan in his career). Because of the terms on his contract, Joel Sherman reports, he will have to earn a spot on the 25-man, but I’ll predict he makes the cut (barring any reliever pickups by Cashman). Most importantly, to me, the deal allows Joba Chamberlain or Phil Hughes to secure the set-up spot in the bullpen (hopefully not both). Sorry folks, but David Robertson was not ready to have that job without a legitimate backup option on opening day. Now the Yankees will be able to groom Chamberlain or Hughes as a starter in 2010 and be able to seamlessly bridge the gap to Mariano Rivera . My guess is the last spot in the rotation is up for grabs in spring training. As most of you know, I’d prefer Hughes as the starter, but I think the Yankees will go with Chamberlain because of his experience. Yankees returning to unsuccessful ways of decade? Is it just me, or are the 2010 Yankees beginning to look a lot like the Yankees who didn’t win a World Series from 2001-2008? Nick Johnson was a likable guy but he had trouble staying healthy and Javier Vazquez didn’t pitch up to par — especially for a guy with high expectations. I wasn’t following the Yankees as closely back before 2005, but I’m pretty sure the general consensus on the two players was one of discontent. Oh I know, the Yankees have added huge stars in CC Sabathia Mark Teixeira and now Curtis Granderson, but they’ve also lost winners like Johnny Damon, Hideki Matsui and now Melky Cabrera. Not to mention, they’re following the Red Sox’ footsteps by letting go of their icons. I’m thinking of Nomar Garciaparra, Pedro Martinez, Manny Ramirez and, going back further, Babe Ruth! All of the moves the Yankees make sense to me individually. (Maybe not the Vazquez deal. I think an FA signing would’ve made more sense.) The core players are still intact, it’s just the secondary that is changing. If you believe in team chemistry or “a winning combination,” you may be feeling a little hesitant about all the deals. I know baseball is a business. Once again, I like all of the moves individually, but having them all together after winning a championship isn’t setting right with me. Just sayin’. So far, it is very easy to understand every move the Yanks have made this offseason on a logic level. And I would have made every one of them, as well. However, there was no doubt Johnny Damon and Hideki Matsui could take huge at-bats. Will Granderson and Johnson be able to do the same? And Will Vazquez be able to handle the Yankee cauldron, as well? Javier Vazquez was given just one year to prove he could handle pitching in New York, but he couldn’t. Now, he’ll get another shot, as he was traded to the Yankees for Melky Cabrera and Mike Dunn. The Yankees also received lefty reliever Boone Logan from the Braves, but his numbers aren’t very pretty. Judging from the numbers, the Yankees acquired a big time starter for an average — at best — left fielder and two promising relievers. UPDATE: Sweeny Murti confirms the Yankees also sent pitching prospect Arodys Vizcaino to the Braves. First reaction: Advantage Yankees (still). But let’s look a little deeper. Vazquez is owed $11.5 million in 2010 before his contract expires, so that’s definitely a negative. But that’s what he’s been making for the last six years (if you go back to his contract with the Yankees). “I’m outraged and I’m disappointed and I wish them the worst,” my dad says of the trade. Here’s why he might be upset. The Yankees have already tried out Vazquez, and he failed. He was an All-Star, actually, but he ended the year with a 14-10 record, 4.93 ERA and 150 strikeouts — his lowest total in the last 10 years by 29. If you don’t recall, he was one answer to my trivia question last week. If you don’t recall, the Yankees traded away Nick Johnson for Vazquez in 2004, and then re-signed him to a lucrative contract. After blowing Game 7 of the ALCS against the Red Sox (I’m gonna cry), he was dealt to the D’Backs for Randy Johnson. Nice history with the team. Anyway, this trade opens up the outfield market again, unless the Yankees want to go with Brett Gardner in center and Curtis Granderson in left with Jamie Hoffman as the backup (not terrible). The available left fielders: Matt Holliday, Jason Bay, Jermaine Dye (RF), Mark DeRosa and a guy named Johnny Damon. There are options. It also boots Joba Chamberlain and/or Phil Hughes to the bullpen (which I like). I’d prefer Hughes stays in the rotation, but I think Chamberlain will stay because he is more experienced as a starter at this point in time. Remember, they both can dominate the eighth inning. Bottom line: It’s another big trade for the Yankees, and that means a whole new can of worms is open. I’m from New Hampshire. This bothers me. I actually thank Red Sox fans up north for my creation of this blog. Without them, I wouldn’t have cared nearly as much about the Yankees (sad, but true). Apparently, this case has been around for a while, says my friend A.V. Back to the hot stove: Marc Carig of the Star-Ledger is reporting via Twitter the mystery pitcher is NOT Walter Johnson. …What have I got myself into? Late-night trade in the works? Some hot stove insiders (Ken Rosenthal, Buster Olney, Ken Davidoff and Mark Feinsand) are tweeting away tonight, and all are saying the Yankees are in “active negotiations” for a starting pitcher tonight — not named Aaron Harrang. Rosenthal and Davidoff are calling this a trade, so that could be referring to Mike Puma’s report on dealing with the Cubs. It could even go back as far as the Royals’ interest in Melky Cabrera/Brett Gardner. But neither of the two outfielders — or anyone/team at all — have been mentioned (Just not Aaron Harang). UPDATE: Now Jon Heyman is chiming in. If you want to read more updates as the night goes on, keep on refreshing their Twitter pages (or just use Twitter). I say it’ll be a trade: Cabrera and a couple minor leaguers for Ted Lilly. That’s a total guess on my part. Jesus Montero will start the 2010 with Scranton/Wilkes-Barre as the full-time catcher and Austin Romine will begin the year with Trenton, said Yankees vice president of baseball operations Mark Newman this afternoon. Thanks Mark! Apparently he heard I was interested where all four catching prospects would start next year. Does Montero take over for Francisco Cervelli as the Yankees backup catcher by the end of the year? Maybe. I’d say 30 percent chance. Yankees, Cubs talking Carlos Zambrano? Brian Cashman “is believed to have inquired about Carlos Zambrano,” Mike Puma of the NY Post reported early this morning. Putting two and two together, the trade probably included either Melky Cabrera or Brett Gardner. Mark Feinsand’s latest blog entry gives me the feeling it would be Phil Hughes who’d get the boot to the bullpen if they add a starter — not Joba Chamberlain. Hughes pitched just 86 innings last year and would most likely be on an innings limit as a starter, while Chamberlain pitched nearly twice that as a starter (which is actually pathetic, even with an innings limit). UPDATE: Marquis and the Nationals have agreed to a two-year deal. So I guess from there, take your pick. To the right are the Baseball America’s Yankees top 10 prospects list from last year. Austin Jackson and Phil Coke left the organization in the Curtis Granderson trade, Alfredo Aceves is already playing in the show, Andrew Brackman had a dreadful 2009 campaign and missed lots of time along with Zach McAllister. As you can imagine, this year’s list is completely different. One of the first things that sticks out is all the catchers. Four, count’em, four are in the top 10. Jesus Montero and his highly touted bat lead the way, while Austin Romine, the Dominican native Gary Sanchez and 2009 2nd round draft pick J.R. Murphy follow. Be sure to check out the Yankees prospects page on Baseball America for some good insight and interesting projections. Arodys Vizcaino, a 19-year-old (same as me!) out of the Dominican, is one of the most exciting new Yankees prospects that you need to know about. He posted some impressive numbers for a teenager in the lowest levels of the organization the past two seasons. UPDATE: Check out what Yankees VP of baseball operations Mark Newman had to say about Vizcaino. People should definitely be aware of Vizcaino, 19, but of course we've learned the focus in New York is always on today more than tomorrow. Still, Vizcaino is a very good prospect, a hard-throwing right-hander from the Dominican Republic. Yankees senior vice president of baseball operations Mark Newman describes Vizcaino as a pitcher who gets his fastball up to 96 mph with "a hammer of a curveball" and "really good stuff." He had a 2.13 ERA in 10 starts for Class A Staten Island this year and will be one to watch. Check back for more Yankees prospect analysis as the winter goes on. That’s Danilo Gallinari stuffing Acie Law’s layup in the closing seconds to secure a victory the Knicks nearly botched. I admittedly have not been following the Knicks as closely as usual this year (no fantasy team, keeping up with the Yankees), so I have to say, I really like this guy based on what I saw tonight. Ok, so the Yankees probably don’t have any room for him. But how about the Mets? I mean, he’s already wearing their orange, blue and white! The top 3 are relatively strong, but I think the Yankees need to have better backup options or replacements for Chamberlain and Hughes then what they have now (Alfredo Aceves, Sergio Mitre & Chad Gaudin). Joe Pawlikowski at RAB believes the Yankees already have one of the top pitching staffs as is, and any addition would put them over the top. I wholeheartedly disagree. I think that’s a very optimistic attitude for having two inexperienced pitchers as the fourth and fifth starters. I think the two are great fifth or sixth starters, but below average fourth and fifth. Next poll: Which combo would you rather have for 2010? UPDATE: Check out this comparison of the two tandems before voting. Signing Nick Johnson changes everything. That is, if he’s healthy enough to play. Without him, I slotted the other offseason acquisition, Curtis Granderson, second in the order. Last year, Joe Girardi put the faster player (Damon) second and the slower player (Matsui) fifth. Though following that logic with Johnson and Granderson doesn’t make sense, as a guy with the third highest OBP in the major leagues last year belongs at the top of the order in front of the run producers (Tex & A-Rod). Like Matsui, Granderson provides some protection for A-Rod with his pop, especially in the new Yankee Stadium. Against lefties, all I do is switch Granderson and Cano. Hopefully by the end of the year, the two won’t have to switch with Kevin Long’s help. As far as I’m concerned, this lineup is the best it can be for its price. Of course, adding Matt Holliday would kick Melky’s weak bat out of the lineup, but that money would better serve the pitching staff. Do I believe him? Yes. Will that day ever come? I don’t think so. Seriously though, when do you think his cutter is going to stop working? He lost a little velocity in the pitch compared to last year (maybe 3mph), but that may have actually helped his numbers! In the last seven years, he’s posted six season ERAs under two. In that span, he’s saved 313 games. He also ranked in the top 15 for Most Valuable Player in the American League for the sixth time in his career. Oh, and it never hurts to add the fact he earned his first career RBI on his first career walk in 2009. Here’s the link for the video if you’re having a bad day. Yanks to sign Johnson, next up DeRosa? If Twitter had a ‘like’ button, I would definitely have liked Buster Olney’s tweet this morning. I like all three points he makes. The Nick Johnson signing secures the DH spot and helps bring back some of the offense lost from Johnny Damon and Hideki Matsui. It does leave Melky Cabrera for left field, which wasn’t my preference, but it’s only a minor concern. Olney’s use of “definitely” excites me. There have been reports of the Yankees being “very interested” in Ben Sheets, so I’m guessing he’s going to be the guy. I would much rather have the big money go to Sheets than Damon. Cashman said Joba Chamberlain and Phil Hughes will be competing for one spot in the rotation, so that confirms the Yankees are seeking a deal. DeRosa is an interesting guy because he’s very versatile but also is looking for a big contract. Normally, big contracts go to guys at steady positions (Mark Teixeira, Derek Jeter, etc.). Today was Curtis Granderson’s first press conference as a Yankee. Since he couldn’t have No. 28 because of Joe Girardi’s stupid system, Granderson settled for half. Fourteen was also his number in high school, so I’m sure he’ll be fine if there was any superstition around No. 28. Eager to get started, the new center fielder, who batted .183 vs. LHP last season, has already spoken to Kevin Long. The two plan on meeting this winter, either in Chicago, where Granderson lives, or in Arizona, where Long is located. Alex Rodriguez said hitters can expect a 10-15 percent jump in production thanks to Long, and believes he will help Granderson improve on his weaknesses. Meanwhile, talks have stalled with Johnny Damon. It’s pretty simple, Damon (probably Scott Boras) is selling him at too high a price and the Yankees feel they have the flexibility to stand pat. However, Jorge Posada thinks the deal will get done. He also agrees with me about signing another starter to allow Joba Chamberlain or Phil Hughes to move to the bullpen (sorry to sound like a broken record). Either someone finally asked the question, or the Yankees finally remembered to mention that they’ll have a new backup catcher in town in 2010. See ya later, Jose Molina, and congratulations, Francisco Cervelli. Nothing against Molina. He was a prototypical backup: good defense, not so much of a hitter and slow as molasses. Cervelli’s a different breed. He’s an up-beat kind of guy with some potential to grow as a hitter and has even shown spurts of speed. He also proved he can handle catching on a regular basis when Jorge Posada and Molina went down in the middle of May last season. Not only that, but he maintained a BA over .300! Maybe he’s a guy who needs to play everyday because he has trouble finding his groove every fifth day. Defensively, he may not be as strong as Molina, but I think his attitude is in the right place. I only heard good things about his relationships with the starters and the rest of the clubhouse. Last year, he caught 10 runners stealing 23 chances. The linked article from LoHud Yankees Blog also noted Alex Rodriguez will NOT need an additional surgery on his hip this winter. Good news all around. Ok. Hideki Matsui is officially with the Angels. Still, it’s going to take me a while to get used to this image. Is Nick Johnson returning to the Bronx a possibility? George King had the first report of a return to the Bronx for Nick Johnson yesterday afternoon. Today, King said Johnson and the Yankees are continuing talks about him being the next DH. Once a Yankee, always a Yankee. The Yankees traded away Johnson for Javier Vazquez back in 2003. Vazquez was a bust for the Yanks, and Johnson was the injury-prone first baseman the Expos expected. As you can see, he’s still an on-base machine. I think he makes a good candidate to DH for the Yankees in 2010 because then they don’t have to spend Boras-money on Johnny Damon. Also, the Yankees have some bats internally that I’m sure they are interested in testing out at DH soon (Montero, cough). The move intrigues me because I like securing a quality bat while it’s still early in the winter. I am strongly advocating the Yankees need to start adding to their depleted pitching staff. Sorry for the lack of posts yesterday. It’s finals week here at Quinnipiac. I’ll be done after Friday. Yankees-Red Sox open 2010 on ESPN2 at 8 p.m. The last bit of news pertaining to the Yankees yesterday was the announcement of the Yankees and Red Sox opening up the 2010 season on April 4, at 8 p.m. on ESPN2 at Fenway Park. That’s going to be one chilly night. Shouldn’t Yankee Stadium host the opener since the Yanks are the defending champions? Here’s another announcement from the MLB: Selig announces committee to review on-field issues. Jerome Cochran, then a scout for the Tigers, saw Granderson, as a sophomore, dash from right field to center one day to catch a deep drive after the center fielder lost the ball. "He had to run about a half-mile to do it," says Cochran, who now works for the Pirates. "A guy does something like that, it raises your intrigue." After watching the Red Sox pick up John Lackey yesterday, Yankees fans might be thinking it’s time to bolster the offense. Well, with Hideki Matsui agreeing to sign with the Angels and Mike Cameron agreeing with the Red Sox, there goes two players the Yankees may have been thinking about picking up. Like my post on Roy Halladay and John Lackey, I’ll break down the deals from the Yankees POV. Sayonara! The reigning World Series MVP is on his way to the west coast. Matsui served seven seasons with the Yankees — two of which shortened considerably due to injury — but most of the time was a consistent bat in the middle of a high-powered lineup. He’ll get $6.5 million to play one year with the Angels and will replace Vladimir Guerrero as their old, injury-prone DH. I wish him the best of luck out there, just as long as he doesn’t kill the Yankees next year. Oh, and he will definitely receive a HUGE standing ovation when he is first expected back in the Bronx on April 13. It pretty much puts the Red Sox out of the hunt for Matt Holliday and Jason Bay (thank god). Now they’ll have Cameron in left, Jacoby Ellsbury in center and J.D. Drew in right. If the Yankees sign Holliday, Bay or Johnny Damon, I say the Yankees easily have the better outfield. The Yankees have coveted Cameron for I don’t even know how long, and I’ve never really understood it. Yes, he’s got great D, but I wouldn’t spend $15.5 million over two years for a career .250 hitter at 37 years old. I’d much rather have a developing Melky Cabrera and Damon as part-time LF/DH. I asked my twitter followers if they were worried about a Red Sox rotation of Josh Beckett, Jon Lester and John Lackey, and I surprisingly heard two sides to what I thought was a one-sided point. MattLorenzo – Its the best in baseball. 5States – I think they’ll be pretty good, but I can’t say I’m super worried or scared. ryan_kantor - Lackey is 31 and has declined over hte past 3 years. Cameron is a huge downgrade from Bay. We still need a SP & a RP though. I thought for sure more people would have agreed with MattLorenzo. None of them are coming off particularly great years, but they all can pitch. So maybe the Yankees don’t need to upgrade their rotation? Well, this just in from Ken_Rosenthal’s twitter feed. Source: #Yankees "very interested" in Sheets, but believe he is in no rush to sign. I missed a huge day on the blog yesterday. Some updates: John Lackey agreed to a deal with the Red Sox. The other top pitcher on the market, Roy Halladay, was dealt to the Phillies in a three-team, blockbuster deal. That’s a lot for one day, but I’ll break it down from the Yankees POV. I’m starting with Lackey because he’s the newest member of the AL East. He is by no means a Yankee killer. In 16 career starts, he is 5-7 with a 4.66 ERA. The Red Sox were probably attracted to his postseason success, 3-4, 3.12 ERA. Props to them, they landed the best free agent starting pitcher available. The deal is reportedly around five-years and $82.5 million — exactly what we all expected. Did the Red Sox overpay? He’s 31 years old, he hasn’t pitched over 200 innings since 2007 and his combined record over the past two seasons is 23-13 with a 3.78 ERA. If you compare him to Burnett, they’re both pretty close if you factor in injury risk, age and stats. This gives the Red Sox a 1-2-3 of Josh Beckett, Jon Lester and Lackey. Not only is that a lot of ‘J’s, but it’s a lot of talent. That probably edges the Yankees for the best rotation in the league. There are still some kinks to be worked out in this, but a deal that would send Halladay the Phillies, Cliff Lee to the Mariners and a boatload of prospects to the Blue Jays has been agreed upon, reports Buster Olney. Bottom line, the Yankees and the rest of the AL East don’t have to deal with Halladay anymore (except in a World Series rematch). Yes, the Yankees missed out, but I think the Blue Jays were asking too much from the Yanks. I don’t think they were ever in serious discussion either. Without the details it’s tough to tell, but I think the Mariners are winners of the trade. Pairing King Felix Hernandez with Cliff Lee poses a serious threat on the Angels, while the Phillies get older with Halladay and have to re-sign him to a reported three-year, $60 million deal. 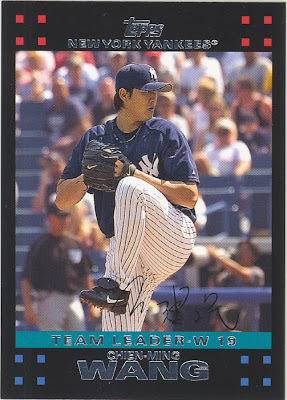 Since Chien-Ming Wang is no longer in pinstripes, I felt it was time to put up this card of him. Thanks for your two years of awesomeness. Note: The card notifies us he was the team-leader in wins in 2006. Thanks for rubbing it in, Topps. I was just checking out Rob Neyer’s top 100 players of “the 0’s” and I stumbled upon an awesome Yankees trivia question. By the way, Neyer ranks Alex Rodriguez second (behind Pujols) and Derek Jeter fourth (behind Bonds). So here it is: What two pitchers of the 0’s struck out over 2,000 batters? Hint: Both pitched for the Yankees at some point in the decade. 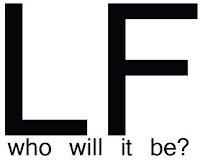 I’ll reveal the answer in this post at 1 p.m. tomorrow, sharp. Post your answers in the comments. The answer can be found in the details of Neyer’s post if you just can’t wait ‘til tomorrow. And no, Roger Clemens did not strike out 2,000 in the 0’s. Mark Feinsand is reporting Brian Cashman is looking into picking up one more starter — namely Ben Sheets or Justin Duchscherer — to allow him to move either Joba Chamberlain or Phil Hughes back to the bullpen. In regards to my poll, I believe the Yankees first order of business is picking up another starter. However, I think they definitely will add an outfielder/DH as well — whether it’s Johnny Damon or someone of a lesser caliber. Some of those names mentioned were just my speculation, but most have been linked to the Yankees. My reasoning behind pick one from each table is that the Yankees are trying to cut back on payroll this year, apparently, so there’s no way they could afford to sign two $10MM+ contract guys. Anyone have another name the Yankees should buy into? The righty has been in the Yankees farm system since 2006. He was close to being called up last year despite posting lousy numbers in Triple-A. Well, my bet is you will definitely be seeing Nova in pinstripes in 2010. After navigating through a part of MLB.com in Spanish, I came across his statistics. If he continues this success through spring training, I believe he has a chance to make the opening day roster. Most likely, however, you’ll see his debut later in the season. I touched on Jesus Montero earlier today. Unfortunately, he’s struggling (3-for-26) for the Navegantes del Magallanes in the Venezuelan Winter League. I like the move by Cashman. It says the Yanks want to re-sign Damon soon, but if necessary, can delay because they understand how valuable Damon’s bat is to their lineup. No matter how bad you think his arm is, if Damon is re-signed, there is no question he is re-inserted back into the No. 2 spot in the order. With the addition of Curtis Granderson, the Yankees would have the option of making Damon a part-time DH by putting Melky Cabrera in left field. But it’s too early to tell at this point. What I’ve feared most has finally become reality. If you’ve been following, I’ve been saying all along that I’d approve a deal for Halladay under two conditions. The Yankees deal either Phil Hughes or Joba Chamberlain — not both. Based on this report, it looks like the only way the Yankees are going to acquire Halladay is by parting with Montero. That’s why I say, it’s time for the Yankees to PULL OUT (like Tiger)! Why am I clinging to Montero so tightly? He’s one of the best hitting prospects in the minor leagues, and he plays at the most valuable defensive position (catcher). His catching skills need some work, but everyone needs to realize he is only 20 years old. He certainly has time to develop his catching skills. This brings me to another point, Austin Romine. If you don’t know who he is, he’s also a catcher for Double-A last year with Montero. At the moment, he possesses a better glove than Montero, but doesn’t nearly have the same bat. I’d prefer to keep both catching prospects, but if I had to risk moving one of them, I’d definitely try and sell Romine. Chien-Ming Wang was officially not tendered a contract last night. Brian Cashman called it a tough decision to let go of the near-Cy Young winner from 2007. As of right now, Wang and the Yankees have no affiliation with each other. It’s still possible the Yankees bring him back as a free agent, but unlikely if they weren’t willing to offer just $4 million to him. Sergio Mitre, Melky Cabrera and Chad Gaudin were all tendered contracts, according to RAB’s Mike Axisa. So, if you have any last words for Wang, feel free to post them in the comments section. Speculation: Jack Cust next Yankees’ DH? The Athletics are non-tendering RF/DH Jack Cust. Why should you care? Because this guy has serious power and I think he could be a good fit for the Yankees as a DH or bench player (to replace Eric Hinske). Please, notice the exclamation mark after his strikeout average. He’s led the American League in strikeouts in each of the last three years. But, along with all of those strikeouts comes a lot of walks. He led the league in 2008 with 111 free passes. He reminds me a little of Nick Swisher, but with more strikeouts and more home runs. Thoughts? In my latest poll, CC Sabathia was named the most important addition to the Yankees last winter. I have no quarrels with these results. Perhaps maybe a few more votes to Mark Teixeira. The guy came in second for the MVP of the league and batted third in the World Series champions’ lineup. Next poll: What area does Cashman need to focus on next? There’s two ‘N’s in Jamie Hoffmann! I’ve been misspelling Jamie Hoffmann’s name ever since the Yankees picked him up, spelling his last name like the closer Trevor Hoffman would. My mistake, Jamie. I’ve just never heard of a Hoffmann with two ‘N’s before! The deadline to tender contracts to players is Saturday. The forgotten Chien-Ming Wang must be offered a contract of at least 80 percent of his $5 million he earned last season ($4MM). So, should the Yankees give this guy another shot? It’s really a tossup. Here’s a guy who put up near-Cy Young caliber numbers for two straight seasons. But Yankees’ GM Brian Cashman has hardly mentioned him in rotation talk for 2010. He’ll open 2010 with whatever team at the age of 30, which gives reason to believe he has his best years ahead of him. But with his injury-plagued 2008 and 2009 seasons, it’s tough to lay down at least $4 million on him. My call: Lay the money down. Pitching coach Dave Eiland should tell him to go back to his old sinkerball ways of 2006 and 2007. Ease up on the slider, there’s no need to break out a strike out pitch so often when you have a dynamite sinkerball.